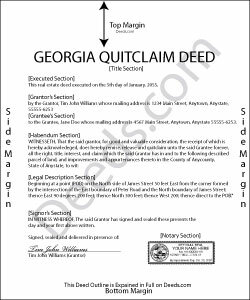 Quitclaim deeds in Georgia are not specifically defined by statute. In fact, according to O.C.G.A 44-5-33, the deed must merely contain sufficient information to clearly represent the grantor's intention. As such, a heading of "Quitclaim Deed" alerts the recorder or title reviewer to the purpose of the conveyance. Quitclaim deed documents do not contain a guarantee title for the grantee. In fact, O.C.G.A. 44-5-61 declares that there is no implied warranty of title in any deed for land. O.C.G.A. 44-5-30, provides the minimum requirements for deeds conveying real property, stating that a deed conveying land must be in writing; signed by the grantor; witnessed by two people who are not parties to the quit claim deed---one witness may be the notary or other official who acknowledges the grantor's execution of the document; and information about the consideration (value, usually money) given in exchange for the property. Deeds must also contain a name and return address at the top of the first page. In addition to these requirements, include the following information to ensure clarity of ownership: the full names and addresses of all parties (grantors and grantees); the grantee's marital status and vesting choice (how the grantee intends to hold title), and a complete legal description of the land. Georgia follows a "race-notice" recording statute. This means that according to O.C.G.A 44-2-1, 44-2-3, all documents changing how land is titled must be recorded in the office of the clerk of the superior court in the county where the land is located. By recording the instrument, the transfer is entered into the public record and serves as notice to future bona fide purchasers (buyers for value). There is no time limit for recording a quit claim deed, but if the same grantor conveys a parcel of land to one grantee, who fails to record the deed, and conveys it again to another grantee who records it, the earlier grantee generally loses the property. Interestingly, Georgia places the burden of recording on the grantee, as stated in O.C.G.A 44-5-47. So, by recording the quit claim deed as soon as possible after execution, the grantee protects the interests of all parties involved as well as preserving a clear chain of title (ownership history), which will simplify future conveyances.